Buckingham County Tithable List, 1764 | slate river ramblings . . . .
Now, in addition to finding various Buckingham County wills digitalized at the Library of Virginia’s “Lost Records Localities Digital Collection,” anyone can access images of the original Buckingham County Tithable List, A-G, 1764. How did the fragment of Buckingham’s 1764 tithable list happen to survive? If you are fortunate to have a Buckingham County ancestor whose surname begins with A-G, you just might find him listed in 1764. 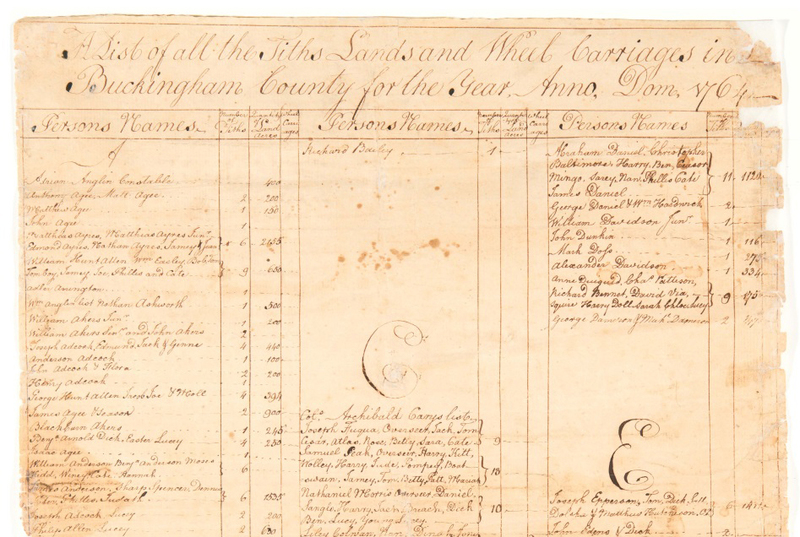 Among these founding families of Buckingham are Agee, Allen, Bell, Bondurant, Chambers, Cabell, Daniel, Davidson, Epperson, Easley, Ford, Flood, Guerrant, and “Garrot.” The names of tithable slaves are also included. The various Davidsons on that 1764 Buckingham tithe list were members of at least two….and perhaps three….unrelated Davidson families. The Alexander Davidson shown on that tithe list was NOT a member of my Davidson family. Alexander later moved to Bedford/Campbell Co., VA, where he and his wife apparently reared three boys and nine girls, His wife was Elizabeth, and it APPEARS that she was Elizabeth Steel/Steele. One of the sons of Alexander and Elizabeth named Samuel Davidson married an Elizabeth Thornhill in 1813 in Campbell Co., VA, and that Samuel Davidson died around 1848 in Appomattox Co., VA. That Samuel Davidson should not be confused with the Reverend Samuel Davidson who married Frances Oglesby in Campbell Co., VA and who was the pastor of Red Oak Baptist Church for many years. Reverend Samuel Davidson was a member of yet a fourth unrelated Davidson/Davison family that came to Bedford/Campbell Co., VA from PA by the late-1770s. The Reverend also died in Appomattox Co., VA (around 1860-1861 or so, as I recall). There were three William Davidsons on the 1764 Buckingham list, and William Davidson “Senior,” as well as the William Davidson who was shown in the home of his likely father David Davidson, were members of my Davidson family….as were Edward Davidson and Edward’s son Charles Davidson. The man shown as William Davidson “Junior,” however, MAY have been the William Davidson who married Martha Baker of “next-door” Prince Edward Co., VA around 1769. If that was, in fact, the William Davidson who married Martha Baker, then he was not related to the other Davidsons on the 1764 tithe list (proven by Y chromosome DNA testing). The terms “Senior” and “Junior” were often used on these old documents just to differentiate between two unrelated men who happened to have the same name. There is also a surviving 1773 Buckingham tithe list. If I recall correctly, all of the Davidsons who appeared on that 1773 list were members of my Davidson family, including the younger Edward Davidson who was shown as an overseer for William Hoy/Hay. Like Charles Davidson, that younger Edward Davidson was a son of the older Edward Davidson who had appeared on the 1764 tithe list. As I recall, the older Edward Davidson was shown on either the 1764 or the 1773 tithe list as being a constable in Buckingham Co., VA. I suspect that the above older Edward Davidson (married Agnes Mosby, who MAY not have been his first and only wife), David Davidson (married Mary Giles) and William Davidson, Senior (strongly appears to have married a Miss Hix/Hixe) were brothers….and they had previously appeared (living close to one another) on a Goochland Co., VA tithe list back in the mid-1740s.